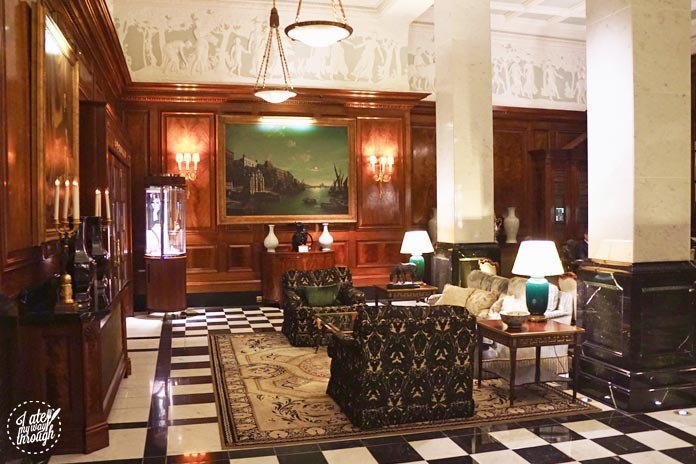 My first memory of the Savoy Hotel was watching a documentary chronicling the £220m renovation it underwent in the 18 months prior to its reopening on 10/10/10 at 10.10am. 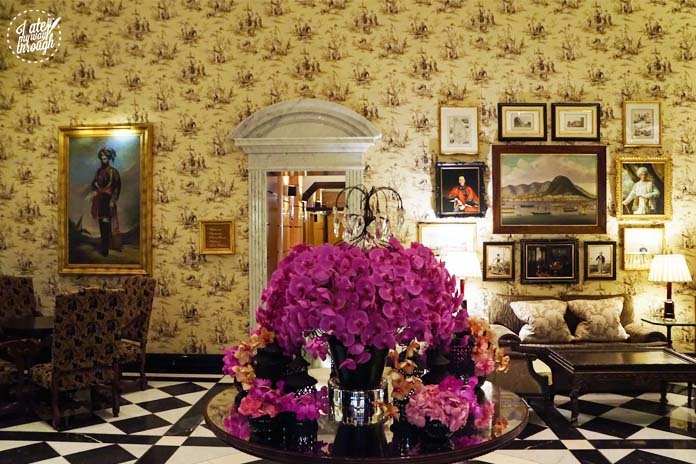 You could say that ten out of ten is the number the hotel strives to achieve in every element of its service and experience for guests. 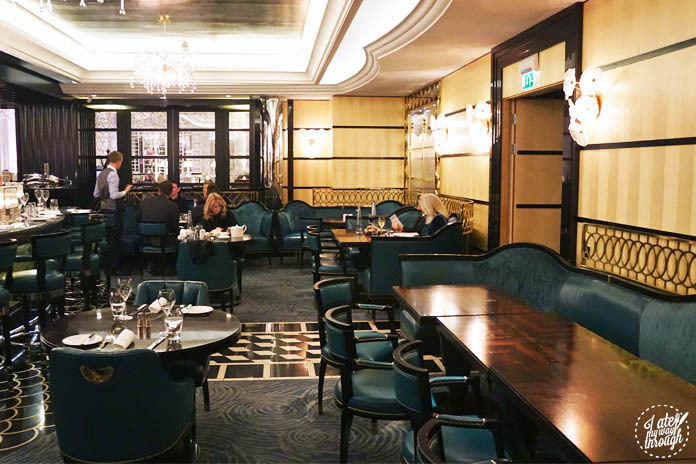 Located on the bustling London street The Strand in the heart of London’s metropolitan area, close to Trafalgar Square, Charing Cross Station, Covent Garden and Leicester Square, this stunning hotel is found down a driveway and backs onto the stunning Thames River. 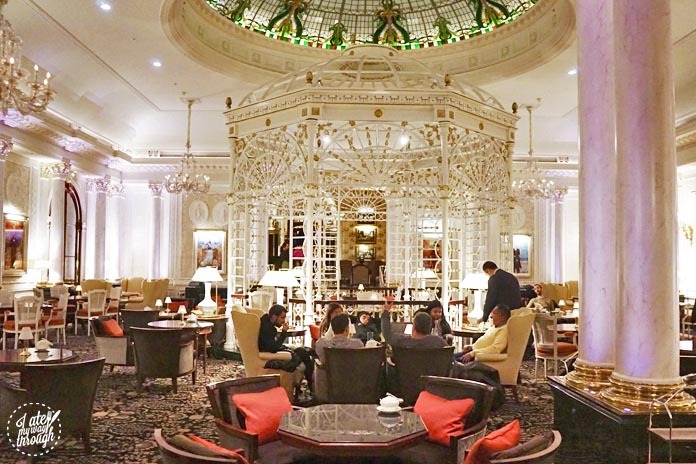 Entering the foyer, and proceeding through the hotel is a breathtaking experience, emitting old world glamour with its stylish classic décor, timber book shelves, golden glowing fire, and an amazing cannery styled lounge perfect for high tea. It’s where I imagine the Queen would love to frequent. Kaspar’s, the hotel’s in-house restaurant is a seafood eatery that boasts an extensive menu to cater to everyone’s tastebuds. The room is brightly lit by the many feature light pieces inspired by oceanic style. A bar sits in the centre of the room, with dazzling white glass hanging down mocking the glassy surface of the ocean. Teardrop chandeliers dangle from the ceiling whilst the glimmering lights decorating the wall are reminiscent of coral plants deep in the reefs. The room is distinctively fashioned, with mid-blue accents reminiscent of the ocean, and a carpet patterned just like fish scales or a mermaid tail (depending on your preference!) Alongside the mermaid scales is a black & white checked floor speaking character and style, simultaneously retaining its old world charm. 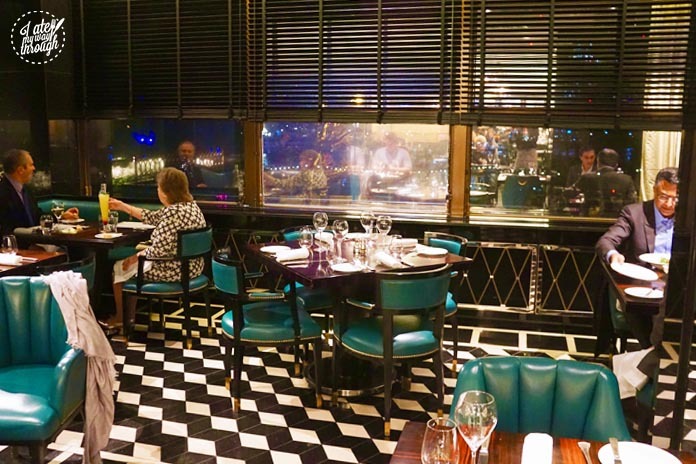 The menu is seafood focused, with smoked and cured fish at the centre, grilled fish, caviar and crustaceans, sushi and sashimi alongside an array of timeless dishes such as schnitzel, burgers, duck, salads, soups and other classics. 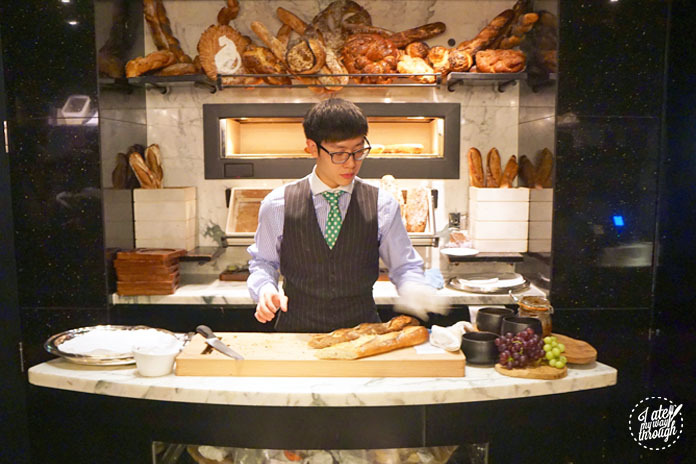 Some warm freshly cut bread was delivered to the table, having been hand carved at the restaurant’s impressive marble bread station. It was accompanied by fresh butter, a house-made aioli and some incredible olive oil. 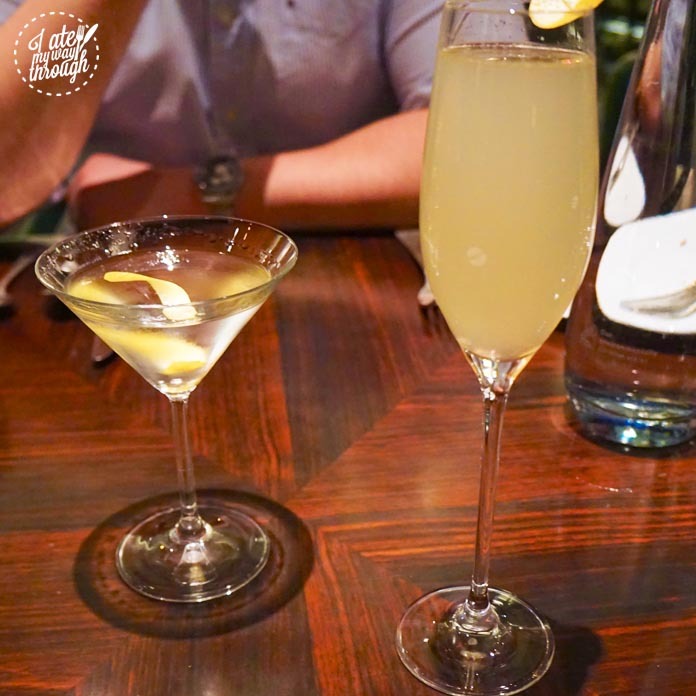 We also enjoyed two of their signature cocktails, the Kaspar’s Martini (£15) and Kasparette (£16.50). The Kaspar’s Martini was a twist on the classic, with your choice of vodka or gin, a dash of vermouth, completed with a lemon twist. It was designed to be paired flawlessly with the seafood orientated menu for smoked and cured fish. Meanwhile the Kasparette was a take on the light and refreshing champagne cocktail. French champagne is mixed with elderflower, vodka, lemon juice and champagne to yield a delectable aperitif to begin the evening! 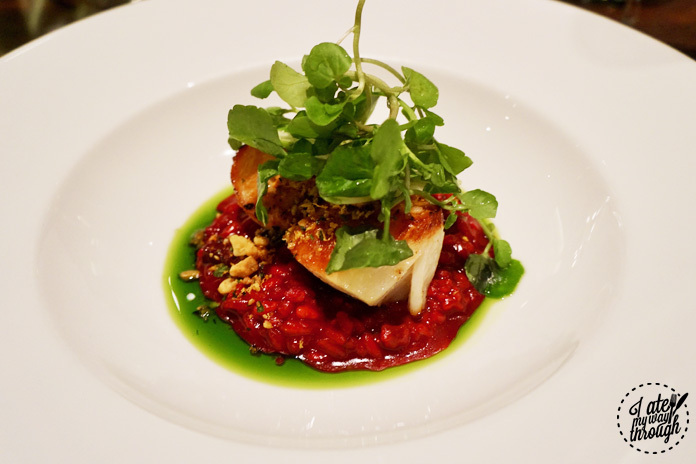 For our entrées, the waiter advised us of the signature dish of Pan-roasted scallops with beetroot risotto, citrus gremolata & watercress (£20). Two of the biggest, juiciest, plumpest scallops were cooked to perfection, with a golden outer crust but moist within. Below was a creamy ruby pink beetroot risotto, with notes of cheesy richness shining through. The crunchy citrus gremolata crowned the scallops adding a zesty flavour to cut through the richness and add texture, all finished nicely with the light fresh greenery of watercress. My counterpart opted for the Lobster & Cornish crab bisque, espelette & fresh lobster (£15). Poured before us at the table, the rich seafood stock was creamy, and perfect for the cold winter weather outside. Filled with gorgeous little bits of lobster meat and a light smokiness from the espelette French pepper powder, it was gobbled up without any trouble. 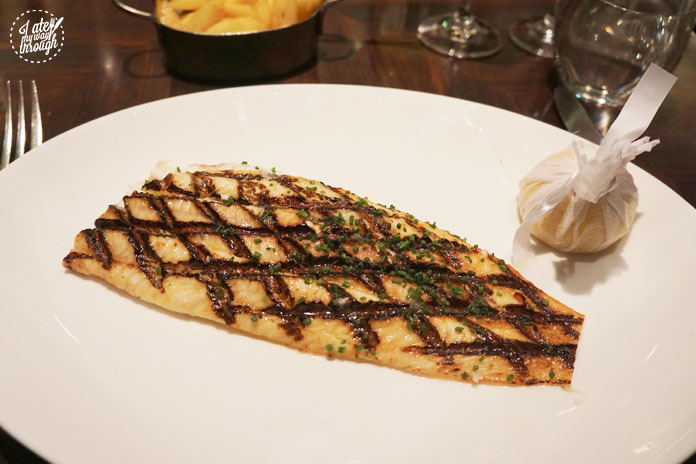 For mains I decided to try one of their signature fish From The Grill of the Dover sole (£39). Having never eaten this variety of fish before, I was intrigued to see how the fish would look or how my plate would arrive. One can pick from the mouth-watering sauces of Lemon Hollandaise, Brown butter caper sauce, Roasted garlic & rosemary jus, Green Peppercorn sauce, Sauce Béarnaise or Seafood nage. The Dover sole is a meaty white fish which was cooked flawlessly with hatchet cross patterns from the fresh grilling on its outside. It was a generous serve with two large pieces of white meat, topped with a sprinkling of chives. Alongside I elected for three of the sides from the many alluring choices. The Honey glazed parsnips (£5) were little wedges of golden parsnip with a sweet sticky glaze that made them addictively good. The Truffle & chives mash potatoes (£9) was a pot of velvety goodness infused with truffle notes, that enhanced the mixture and created a smooth silky purée that slid down effortlessly. 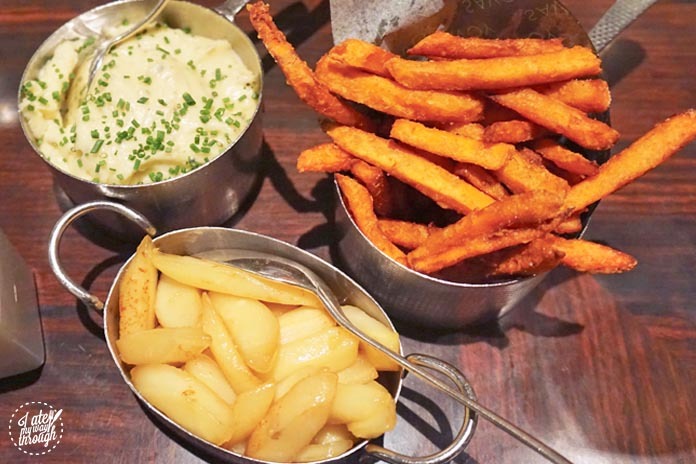 My favourite out of all were the Sweet potato fries with smoked paprika mayonnaise (£5). These are the crunchiest bright orange sticks of carby heaven! So scrumptious especially with the invigorating creamy orange mayo, these were quite the naughty side dish! The other main was Crayfish ‘Carbonara’ linguini with bacon & egg yolk (£25). The thin linguine pasta melted in one’s mouth with a creamy seafood bisque similar to our entrée and tiny little bits of bacon. 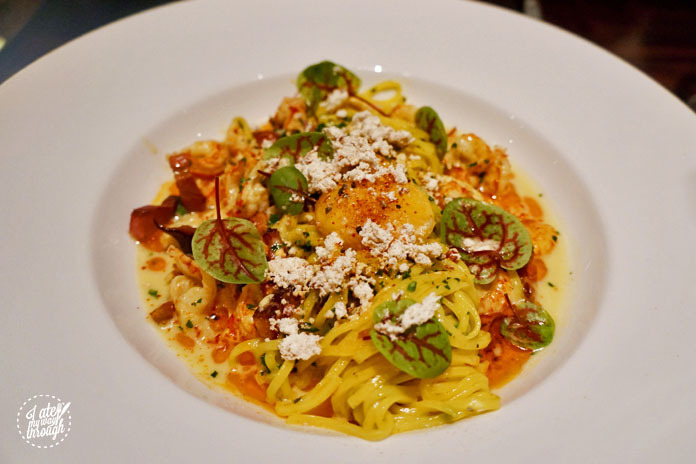 Crayfish meat was dotted throughout the pasta, which was elegantly spun, and adorned prettily with delicate leaves & a bright shining egg yolk begging to be burst. 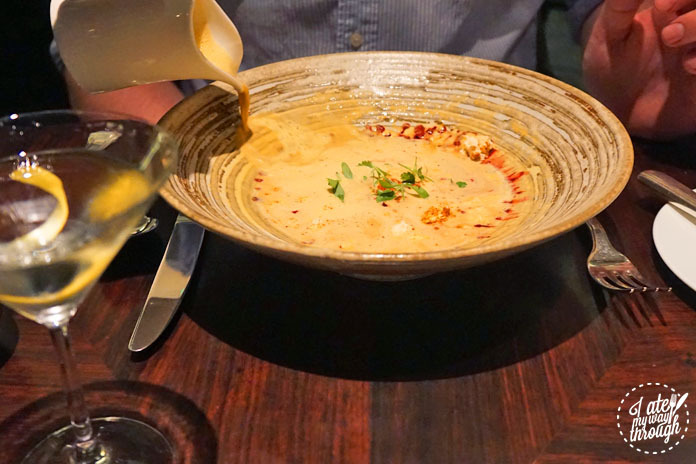 It was a charming dish, but very similar to the Lobster bisque we had enjoyed for an entrée, so perhaps next time we wouldn’t select two so alike. 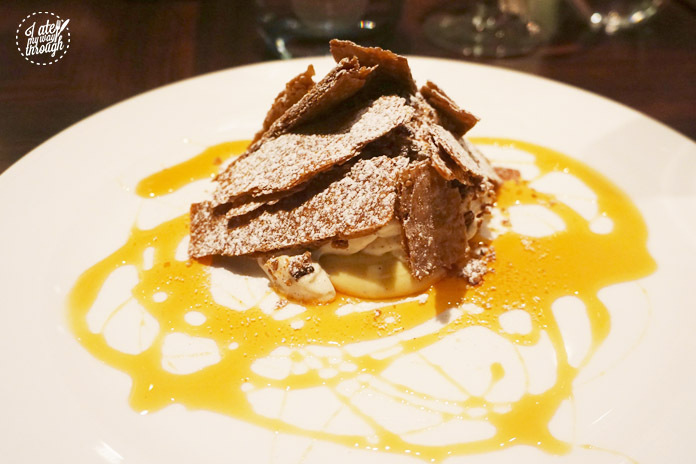 Dessert had us stumped for choice with so many tempting options such as the Dark chocolate torte, Apple tarte tatin, Sticky date pudding, Hazelnut semifreddo – I just didn’t know what to pick! Eventually with the help of our kind waiter, we landed on the Liquid salted caramel, vanilla mousse, puff pastry & crystallised pecan nuts (£10) and Alsatian bread & butter pudding, Kouglof brioche & brandy ice-cream(£10). The liquid salted caramel included shards of crispy pastry arranged in a graceful pile, dusted with icing sugar and a sticky caramel sauce. Underneath was a thick creamy caramel flavoured custard with a mouth-watering gooey centre. 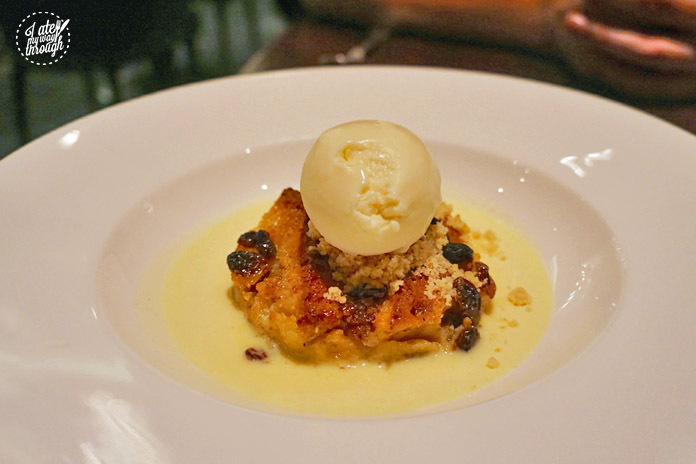 As a huge fan of bread and butter pudding, the Alsatian pudding was a crowd pleaser. The rich brioche bread, soaked in a thick decadent sauce, dotted with sultanas and a generous big scoop of brandy ice-cream was the complete winter warmer against the London cold weather outside. To finish, their celebrated after dinner delight The Fast Cat (£15) went down an absolute treat. 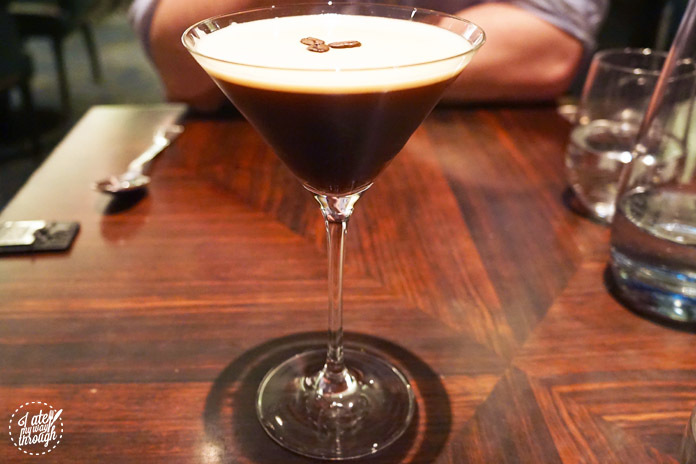 Kaspar’s adaption of the classic espresso martini contained a hint of orange liqueur making it a little like an alcoholic chocolate liquid Jaffa! 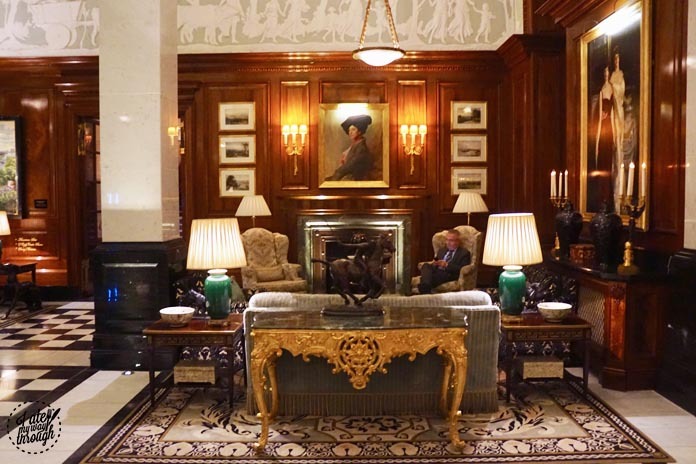 I highly recommend Kaspar’s for an indulgent meal in one of London’s oldest and most celebrated hotels. 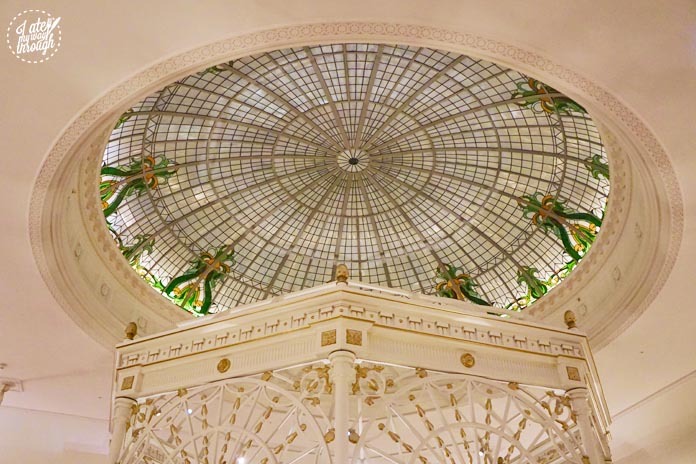 Not only is the food amazing, but the staff are attentive, the old-world charm fused with modern day style makes this a unique but unbeatable place to dine.